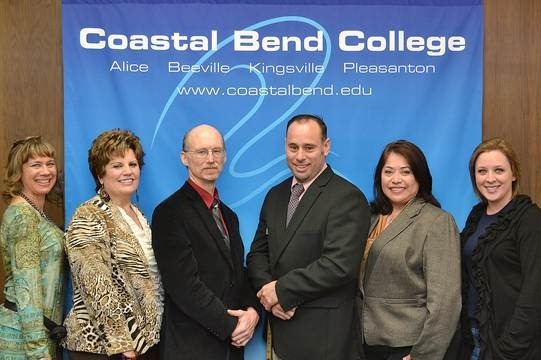 From left: Kathlyn Patton, Dr. Twila Johnson, Mark Secord, Pete Trevino, Velma Elizalde and Lisa Clark are the newest members of CBC’s leadership team. Collectively, they have decades of experience in serving and educating students in higher education. What Espinoza is referring to is Coastal Bend College’s recent re-organization and newly filled positions. “The two vice president positions alone represent over fifty years of cumulative CBC experience,” she continues. Velma Elizalde, Vice President of Student and Administrative Services, began her association with the college as a high school sophomore in the federal Upward Bound program still housed on the CBC campus. “The successes I have enjoyed in my professional career are a direct result of my affiliation with Coastal Bend College,” says Elizalde. “Through Upward Bound, I was introduced to a world that gave me access to experiences very different from my own. The program and its staff, like Pete Martinez and Nick Cardenas, provided me the support I needed to succeed. I have been fortunate to serve CBC in positions that have allowed me to pay it forward. Mark Secord, Vice President of Instruction and Economic & Workforce Development, echoes Elizalde’s commitment to supporting a student-centric environment at the college. “This is a very exciting time. Not only for me personally but for the college as a whole. We have a great group of people that are all student-centered. I can’t say that enough. I’ve worked here for over 20 years in the science department, most recently as division chair. I know first-hand that CBC has experienced and devoted faculty, staff and employees. Johnson comes to CBC’s main campus from the district’s Kingsville site and started with Coastal Bend College as an instructor. “Prior to becoming the Dean of Academics at CBC, I was the Interim Director for External Affairs at the Kingsville site, and prior to that I was full time faculty teaching history and government. Before coming to CBC as a fulltime instructor, I had been teaching for the Kingsville Independent School District since 1995. Trevino comes to Beeville from the district’s Kingsville site where he had functioned as a Special Needs Counselor, Interim Site Director for Campus Management and Lead Counselor. Trevino has been with the college almost seven years and has over seventeen years of managerial and administrative experience. Kathlyn Patton, Dean of Administrative Services, reiterates the connection to students. “I am a Beeville native. From the time I started my college work at Bee County College, I’ve been grateful that our community has the college. I have a Bachelor’s and Master’s in Business from Texas A&M and have been at the college for over twenty-four years now. And the fact that I was a student here once is something I am very proud of. It influences everything I do. “The business office plays a similar role,” says Lisa Clark. Clark has recently been handed the task of acting as the college’s Director of Business Services, overseeing and monitoring all the college’s budgetary and financial activities. This is no small task. Clark received her Bachelor of Business Administration in Accounting from Texas A&M Corpus Christi and worked for the institution eight years prior to coming to Coastal Bend College. “Working for A&M Corpus really was great experience. I rely on that experience especially when dealing with the state,” continues Clark, “there’s really no way of anticipating when some major policy change might come down from the legislature that significantly impacts our budget. Leadership at the college continues to look for innovative ways to keep the institution focused on student success. Anyone interested in sharing their insights and comments regarding student success at CBC is encouraged to contact Susan Smedley, Director of Marketing and Public Relations, at (361) 354-2399 or by email at smedleys@coastalbend.edu.